Considering liposuction in Little Rock? We offer a better liposuction option to remove unwanted fat and sculpt a thinner, more beautiful contour to your body. It’s called VASER Lipo, and it achieves superb liposuction results with considerably less down time. VASER also helps your skin contract to your new slimmer physique, so your results look smoother and more natural. What are the Benefits of VASER Lipo? VASER liposuction (Vibration Amplification of Sound Energy at Resonance) is a relatively new and increasingly popular method of body contouring. This versatile liposuction platform uses ultrasonic energy to emulsify fat before removal, allowing for reduced trauma and less downtime after the procedure. Additional benefits of VASER include reduced loss of blood and better skin contraction. Candidates for VASER liposuction will exhibit localized areas of body fat that are unresponsive to diet and exercise. Many different areas can be treated with VASER liposuction, including (but not limited to) the tummy, back, flanks, hips, thighs, buttocks, neck/chin, arms, chest, knees, and ankles. During the first step in the procedure, Dr. Branman administers tumescent liquid to saturate the layers of fat. Next, ultrasonic energy precisely targets localized fat areas and emulsifies the fat cells before removal. A special cannula is used (just as in traditional liposuction) to remove the emulsified fat with suction. These techniques are performed with precision, taking extra care to preserve the nerves, blood vessels, and connective tissue around the treated area. Compared to traditional liposuction, VASER liposuction typically carries a reduced recovery time. The downtime you experience after liposuction will always vary depending on the extent of your treatment. Most patients need 2 or 3 weeks to return to their normal routine. During the initial post operation period, you may be unable to notice or fully appreciate the results. However, after a few months you will realize the difference – whether it is a slimmer tummy or more toned neckline – and you may love areas of your body that you, well, didn’t love before. 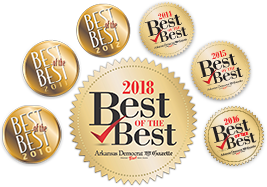 VASER Lipo, and all cosmetic surgery procedures, are performed by Little Rock cosmetic surgeon Dr. Rhys Branman at Arkansas Surgical Hospital or in our in-office surgical suite.